• Bring together members of the ICOM global community including representatives of national and international committees, regional alliances, and ICOM affiliated organizations as well as other museum and exhibition professionals worldwide. • Encourage exchange of ideas, experiences, lessons learned, challenges, and best practices accessible to museums of all sizes and disciplines around the world. ICEE webinars are free and available to ICEE individual and institutional members, and the ICOM global community including members of national and international committees, regional alliances, and ICOM affiliated organizations. Based on availability, the webinars will be open to other non-ICOM museum and exhibition professionals worldwide. Registration is required. Participants will be asked to provide their ICOM membership ID during registration. ICEE and ICOM institutional members are encouraged to host local Webinar Watch events inviting staff members and other local museum professionals to watch the webinars. The Webinar Watch events will contribute to increase the exchange of ideas and will bring together local museum and exhibition colleagues. 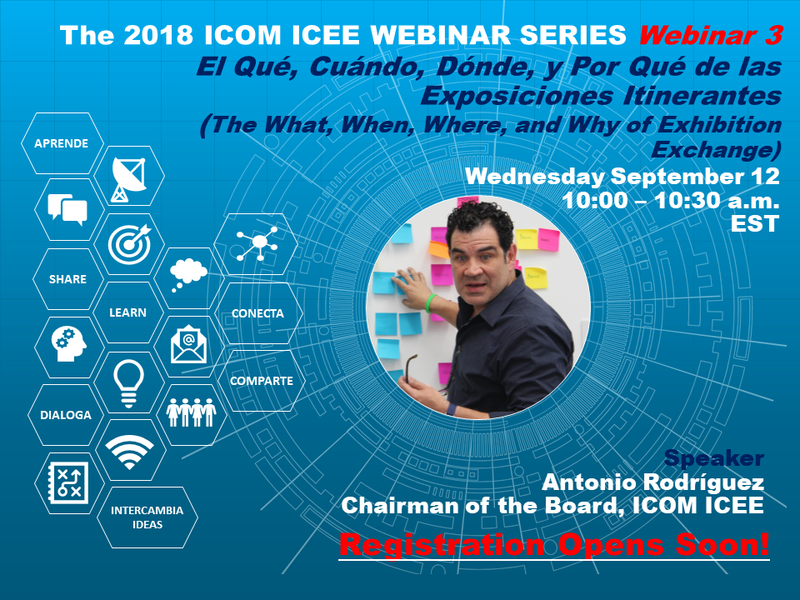 If you are interested in hosting a Webinar Watch event, please contact the ICEE team at programs.icee.icom@gmail.com. A Webinar Watch event consists of networking with local colleagues, participation in a group viewing of the live webinar, and post-webinar facilitated discussion. Further guidelines for hosting a Webinar Watch event will be provided. ICEE will offer a live informational webinar on Thursday, June 21,10:00 -10:30 a.m. Eastern Standard Time (EST), to help introduce the webinar series to global participants who may not be familiar with this type of online learning opportunity. This welcome webinar will be presented live, and will be recorded for later access. Click here for a full description including speaker information and intended audience. Click here for a full description including speaker information. Sign up HERE to receive the registration announcement as part of the ICEE monthly newsletter! The schedule for the second part of the series will be announced in early September. Registered participants receive access instructions prior to live event. All ICEE live webinars feature text chat, audience interactivity, and access to presentation handouts and other resources. All webinars are recorded and archived for later access (ICEE members only). The schedule for the second part of the series will be announced in early September. Greg Stevens is a highly-regarded leader in museum professional development, career coaching, and mentoring. Mr. Stevens directed the American Alliance of Museums (AAM) Professional Development program between 2007 – 2018, addressing career management, leadership development, and skills-building for museum colleagues.